The first Comic Book Convention I attended was the 2010 San Diego Comicon. I was there to help announce the Xbox 360 Halo Reach Special Edition console, which I drove as the Global Product Manager at Microsoft. It was an interesting experience to say the least, and I did get to attend a Smallville panel (my favorite show), for their last season. 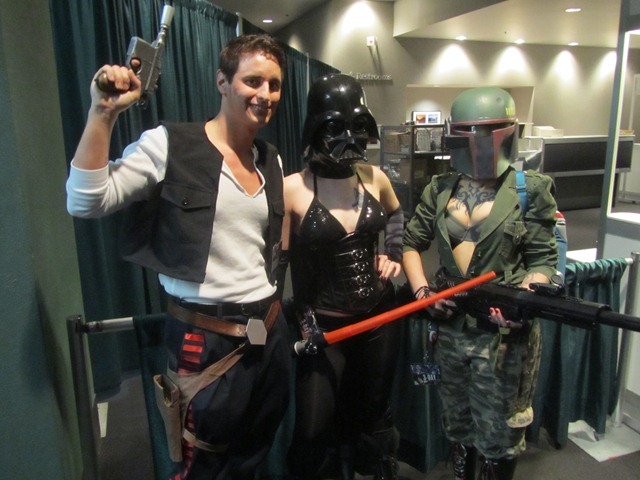 So when my wife (of all people) told me that Seattle has its own Comic Convention called Emerald City Comicon, I decided it would be an interesting way to spend the weekend. I arrived well before the 10am start time to purchase my tickets, spending just under two hours in line. 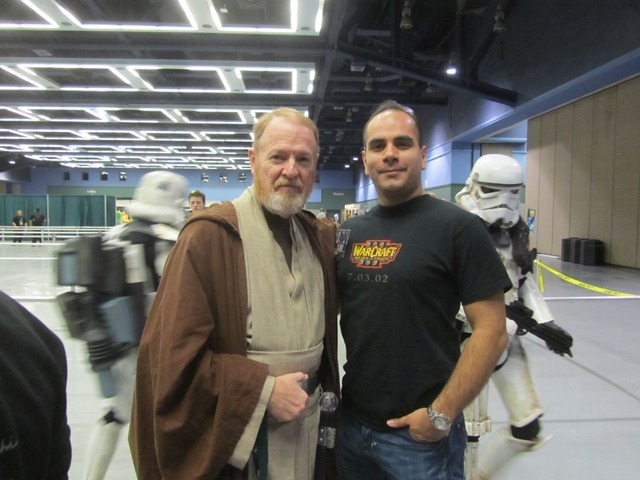 My first picture opportunity came in that line with a group of Star Wars Stormtroopers and a decent Obi-wan Kenobi cosplayer. After getting in and walking the main floor, I quickly realized that this was quite the different convention than San Diego Comicon. 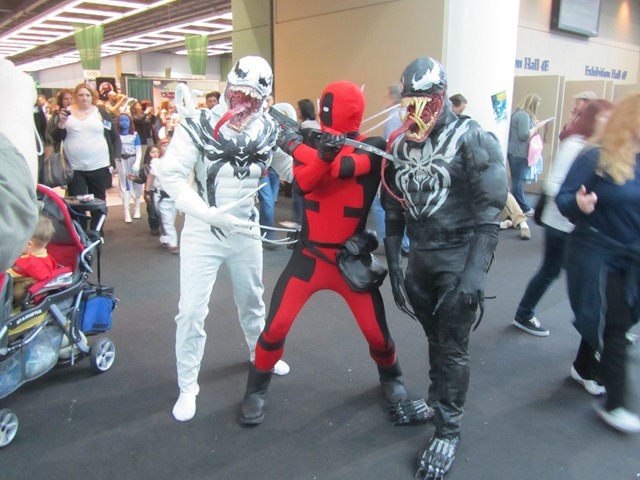 First off, it was actually truly a Comic Book Convention. The majority of the booths on the main floor were for comic book stores, whereas the San Diego Comicon has been taken over by lots of different media, including TV, movies, and videogames. After trolling the floor for a bit and marveling at the $400 classic Transformers figures (and being bummed out that I don’t have my childhood Transformers anymore), I decided to spend most of the day attending the panel sessions. According to 20th Century Fox, X-Files 3 is in the writing stage. The main plot revolves around the pivotal date December 12, which Mr. Kallenbach says was a major part of the fiction of the TV series. The movie is tentatively titled “X-Files: End Game”. Elizabeth Hurley is slated to play a villian on the new Wonder Woman television series. Paramount Studios authorized $175M for the Star Trek movie sequel to J.J. Abrams without ever reading a script. Robert Downey Jr. and John Favreau don’t like each other. Because of this dislike, Mr. Favreau will not be involved in Iron Man 3. Additionally, when Downey Jr. found out Mr. Favreau was involved in Cowboys vs. Aliens, he turned down the part which later went to Daniel Craig. At the end of this panel I received a pass for two to see a pre-screening of Battlefield: LA. After getting this pass, I went to the main room in 4A for 5 straight panels. 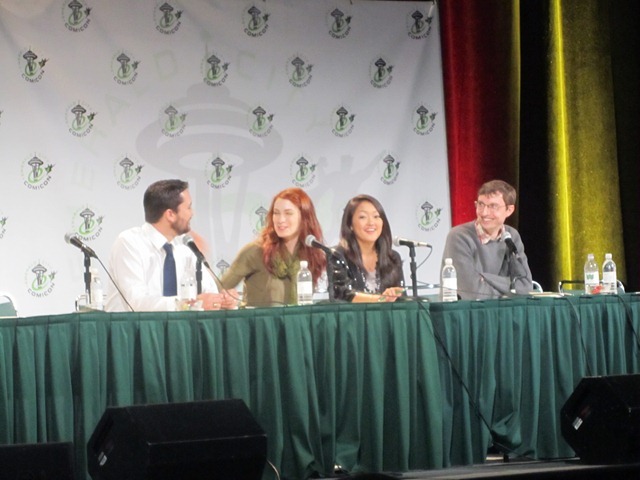 First up was a panel on The Guild with Felicia Day, Wesley Wheaton, and Amy Okuda. The banter between the three was some of the most enjoyable of all the panels that day. Asked if it was difficult to audition in Hollywood being Asian, Ms. Okuda mentioned that she finds it easier since there are not that many Asian actresses to compete with as opposed to the glut of blonde Caucasian women. Mr. Wheaton, who I’ll admit I loathed as the character Wesley Crusher on Star Trek: The Next Generation, did a great job on the panel and had me switching my tune by the end. I stayed on afterwards to watch the Fringe panel. 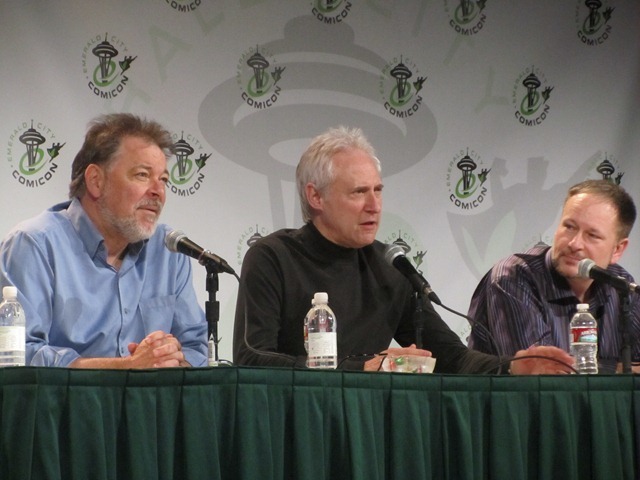 I must admit, I had never heard of this particular Fox show, but since I was able to get a front row seat, I didn’t want to give it up as I was looking forward to the Frakes/Spiner panel. As I tweeted about the Fringe panel, I started to get some fans sending me information about the show, peaking my interest. Since I was a big fan of the X-Files growing up, this seems like a show I’d enjoy. 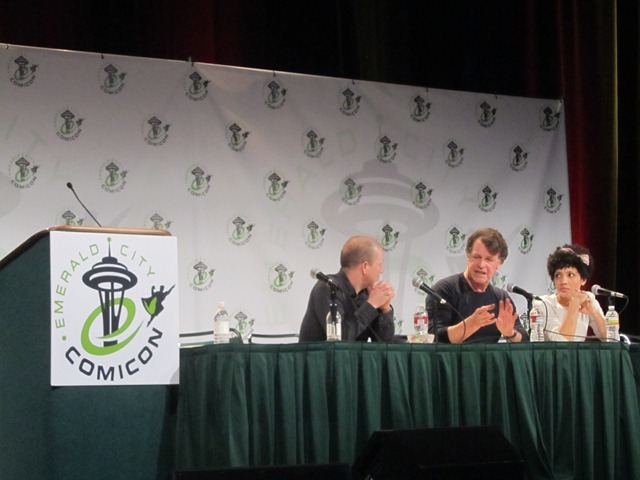 The panelists were show stars John Noble (Walter Bishop) and Jasika Nicole (Astrid Farnsworth). The Jonathan Frakes (William Riker) and Brent Spiner (Data) panel was definitely a treat, kicked off by Mr. Spiner impersonating Patrick Stewart. It was moderated by a local radio host BJ, who apparently did an excellent job moderating the panel on Friday and was therefore invited by Frakes to moderate this panel. Unfortunately, he didn’t do a stellar job at this panel. At one point he started talking about Mr. Spiner’s recent colonoscopy posts on twitter, and started sharing his own rectal exam stories, prompting the audience to shout to him to move on and take audience questions. To his credit, he immediately opened the floor to questions. One unexpected tales from Mr. Spiner was his admission that he remembered a certain episode of Star Trek: The Next Generation because it was on his birthday and he was suffering from a shingles outbreak. As Mr. Spock would say, “Fascinating”. The next panel was for Buffy the Vampire Slayer, including show stars James Marsters (Spike), Nicholas Brendon (Xander), and Clare Kramer (Glory). My older brother was a huge fan of this show. I’ll admit I know about it and have seen the random episode here or there, but never truly followed it. I tried to remedy that by starting the series from Season 1 on Netflix, but didn’t get very far. In any case, James Marsters played Braniac on my ultimate favorite TV show Smallville, so it was still worth sticking around. The final panel I attended was “Spotlight on William Shatner”. 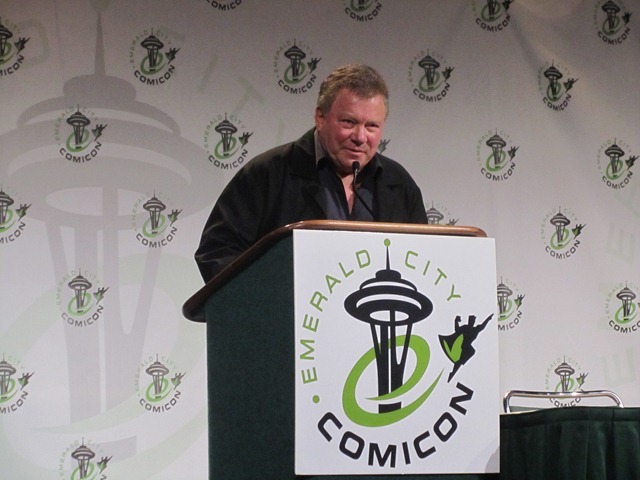 This was a self-moderated solo appearance by Mr. Shatner. He started off taking questions immediately from the audience, and took an average of 5-7 minutes answering each question. At one point he became so engrossed in his own story that he completely forgot the question he was answering. Nevertheless, he made a strong connection with the crowd and kept us entertained with his stories. My favorite story came when he was talking about his disappointment with the Star Trek Generations movie and the need to kill of the Captain Kirk character. They originally filmed him being shot in the back. Thinking that Captain Kirk deserved a more heroic ending, they re-filmed this to have him die by a bridge scaffolding falling on him. Here he discussed coming up with his favorite line ever… With all the years of hearing “Captain on the Bridge”, he wanted to say “Bridge on the Captain”. For obvious reasons, it wasn’t approved and the line was cut. The rest of the show I spent walking the main floor and capturing some of the great costumes worn by the dedicated attendees. I leave off with some highlights from what I was able to capture. 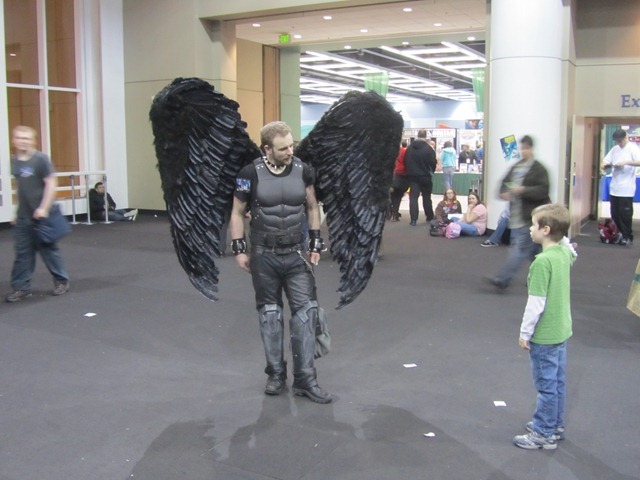 This entry was posted on March 6, 2011, 10:57 am and is filed under Entertainment, Hobbies, Personal, Travel. You can follow any responses to this entry through RSS 2.0. You can leave a response, or trackback from your own site.